Coming off a nor’easter that spread high-tide flooding across the Shore area and battered local beaches, another storm is developing that could bring snow, rain and wind to the region. 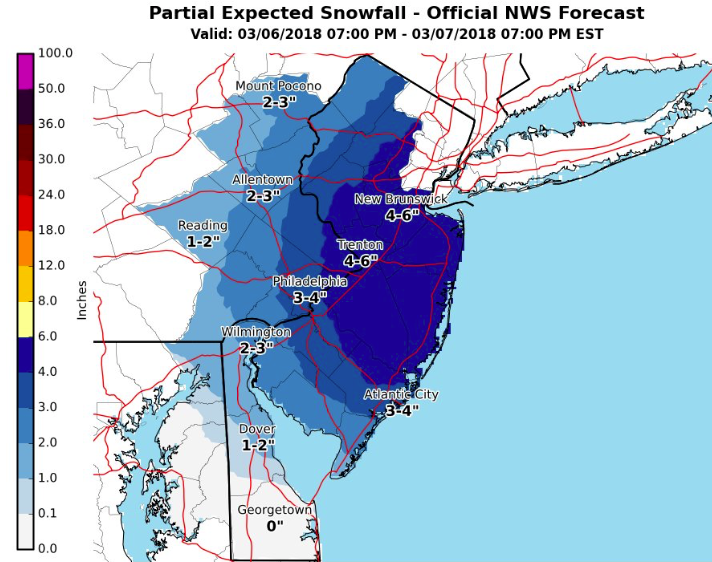 The National Weather Service’ office in Mount Holly said after sunshine Monday and Tuesday, the storm system will move in Tuesday night, starting as rain and turning to snow after 10 p.m. The storm will be producing all snow by after midnight into the early morning hours Wednesday, the forecast said. The precipitation will remain snow before 10 a.m. Wednesday, then rain and snow between 10 a.m. and 11 a.m., then rain after 11 a.m. The rain will turn back to snow after 7 p.m., when it could be heavy at times. The overnight low will be 31 degrees. Snow showers could linger until 7 a.m. Thursday, according to the NWS forecast.